Bed Bath & Beyond Inc. (NASDAQ: BBBY) on Thursday posted worse-than-expected earnings, sending the company’s shares down more than 10 percent. The home-furnishings retailer said profit dropped more than 30 percent to $75.3 million, or 53 cents a share, in the fiscal first quarter. Analysts had estimated earnings of 40 cents per share. While revenue was flat at $2.7 billion, also missed analysts estimate by $50 million. The company said the soft result is due to higher expenses, including shipping, advertising and coupon expenses. "The Company did experience increased softness in transactions in stores, as well as higher net-direct-to-customer shipping expense, coupon expense, and advertising costs ... It remains to be seen whether these challenges were more pronounced in, or unique to, the first quarter due to the smaller sales base in this period, and/or a later start to the summer selling period." The company said. Comparable sales, an important performance measure for retailers, also fell about 2 percent. Despite the weak first quarter result, the company still maintain its guidance for the full-year. 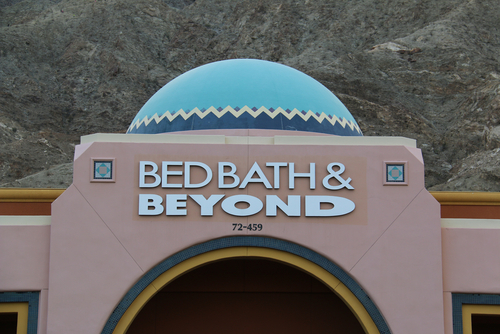 Bed Bath & Beyond shares fell as much as 12 percent to $29.65 on Friday. The stock now is near its 52-week low. The traditional retail industry is facing huge challenge from e-commerce. More and more people choose to shop online rather than going to the brick and mortar store.